Me:Enough! What’s first of its kind? It’s a similar kind of plan TATA Docomo already implemented some time back. Anyways that’s a different part of our story and coming to the present scenario according to the current information available with ARC’s , 121 email support and 121 voice support Airtel is offering only myPlan which consists of 5 different plans 199, 299, 399, 599 and 999 exclusively for postpaid individual users and no other plan is available nor being given to individual customers. So, customers are indirectly forced to select plans only from these 5 available plans below and thus they are entering into myPlan. It’s very nice of Airtel to come up with such plans that provides a lot of comfort to user, appreciate it. Do remember the first two plans are RTP and RTP – FR plans as well providing per/sec tariff. Well if you like these and visit an ARC to convert your prepaid or MNP into any of these Postpaid plans just saying don’t waste your precious time as according to the information they have these plans are not available and you can’t get into any of these 3 post pay plans except myPlan. CC: ok sir, which plan? Are you aware of plans or shall I explain? CC: Excuse me sir, I’m not asking your plan on Donor Network. CC: Discussed with Head of that ARC and came up saying sorry we don’t have that plan and where did you get that plan info from? Me: I didn’t know where to hide my face that time.I waited for 90min to get any help and finally somehow managed to get help from sales head of AP. Even then nothing new happened, same situation and finally I ended up taking myPlan 399 and left that place. Do Bookmark till this part of story as the things that happened after leaving ARC are really interesting and I’ll discusses them in a separate post. If we clearly observe all the 5 myPlan postpaid plans available, all have a base tariff on per minute basis which differs from circle to circle (50p,60p etc.) and hence there is no plan which is in compliance with TRAI’s TTO that is “at least one postpaid plan shall be offered to users with pulse rate of one second for local and national long distance calls and hence this clearly shows that Airtel is not providing it’s individual users with at least one Postpaid plan on /sec basis as both the 99(RTP and RTP-FR) and 499 plans are not given to individual users. We have also shared the same TRAI rule earlier on TelecomTalk as well. 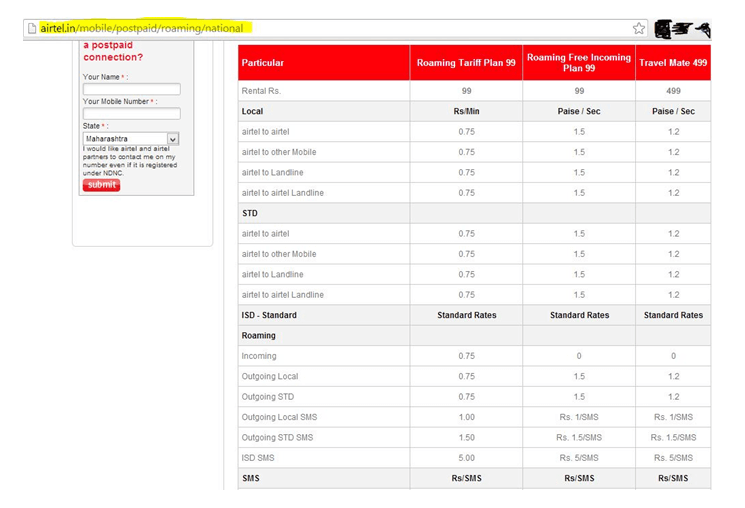 Below is the screenshot of *base tariff (varies for circle) for Airtel my Plan. As ARC’s are no longer allowing or permitting new post pay users to any of its old postpaid plans ( even if you call the CC they say old plans have been removed after myPlan) other than to its 5 available myPlan plans it is clearly understood that RTP-FR 99 plan is not provided by Airtel. If we observe these 5 plans none actually gives RTP-FR benefit unless if we add an add-on pack of 75(Roaming Incoming free) which is just a top up and not a base Tariff plan available for customers. This entirely redefines the meaning of RTP – FR plan defined by TRAI. 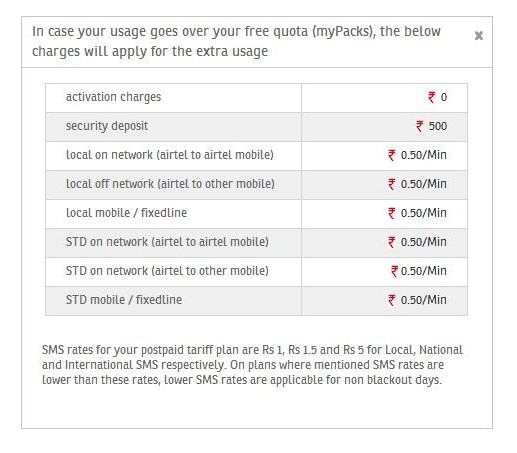 So, if one is not allowed to migrate into or take a plan from RTP 99 or RTP-FR 99(If these are offerings to satisfy those rules) which are mentioned on their site before switching to myPlan, Airtel seems to be in noncompliance with TRAI TTO. As I’m aware any operator takes prior approvals from TRAI of all their plans to introduce them into market I wonder if there are any other postpaid plans from Airtel kept behind the scenes to comply with TRAI TTO. Consider RTP-FR 99 (which is both a combination of RTP-FR and /sec tariff plan) to offer for individuals which ARC’s are not accepting requests for. I don’t understand if this is a miscommunication among their Sales and Service group and top officials who designed the plans or a Marketing gimmick to make people move into myPlan and stop them using any other plans. I have enquired about Travel Mate 499 saying I wanted to move into postpaid from prepaid and cc provided me with document of the plan as well. Now if we take it for granted and go for ARC they say this plan is not available at all and will offer only myPlan to us. After migrating to post pay with myPlan active on my number I again requested for the plan and I got this response. You can’t move to any other plan except MyPlan. So, End of the day what as a user can i conclude? 1. Plans are available but request not being taken by ARC at the time of new post pay connection or migrating via MNP? 2. Plans not available? Then only myPlan offerings are not in compliance with TRAI TTO. 4. Providing those 2 plans (RTP & RTP-FR) to comply with TRAI TTO but not activating to individual users? Whatever it is I have faced tough times migrating into Airtel with the plan as well with the porting procedure. All I can say is myPlan is a Swiss knife to it Business Model. 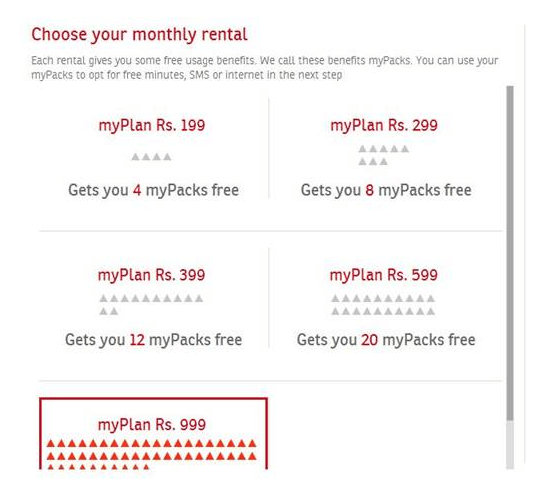 As myPlan is recently launched, only Airtel should know what it is really offering to its individual users. Dear Readers if you are already on myPlan do share us your experiences. PS: It’s not possible to post the entire email communication. I have taken all possible steps to prevent any wrong information to be updated here and these are just my experiences and opinions I faced with Airtel. Have you switched to myPlan or have you faced any issues while switching to MyPlan? do let us know via comments.To come up with this Analysis it took us nearly 20days of groundwork. Table shown above mentions ISD Standard – Rate Standard? What is standard ISD rate? Is it available on all Plans including 199?